. . . Get your biscuits in the oven and your buns in bed . . . This composite offers a glimpse at one of the most dynamic personality oriented radio stations of all time  KVIL, Dallas, Texas! It begins with Morning Man and Legendary Programmer Ron Chapman and his original cast including Andy McCollum and Ben Laurie on news, Bill Mercer on sports, and Suzie Humphreys when she was doing traffic reports from the KVIL-o-Copter. This is Ron at his finest! Fast-paced, topical, funny, and of course, the best listener call-ins of anybody in radio. Next up is Larry Dixon, fresh from WAPE. Later, Larry inherited the morning show at KVIL, but here is a peek at Larry doing 9 till noon. An amazing voice, tremendous content, and a cheerful, upbeat show in mid-days! Jim Edwards follows from noon to three. Another dynamic voice and great communicator, ready with the one-liners. Afternoon drive at KVIL was handled by what Chapman used to describe as a "boogie artist"! Mike Selden came from KLIF in 1973 and brought many listeners with him. He "cooked", always ever-so-carefully, walking the fine line of blue humor. Johnny Michaels had been at KNUS doing mornings and came over to KVIL in 1976 to do nights. Here's a sample of his nighttime insanity on KVIL. One of the interesting things about KVIL at that time was the belief George Johns (National PD for Fairbanks) had of putting bonafide morning jocks on around the clock. After morning drive, formatics were tighter, but the jocks still played it as a morning show. Lots of localism, information, personality, phone interaction, and promotion, all while keeping the format moving forward with momentum. Indeed, any of KVIL's lineup could have done mornings effectively anywhere at the time. 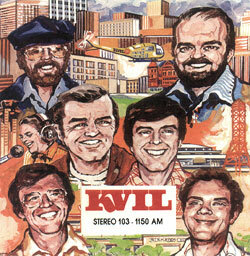 Enjoy this slice of "Highland Park Radio" from the station "Never Restin' in the Shade", KVIL in March 1977.
. . . It's a shame what's happened to radio . . . Produced by Hugh Heller, this jingle was the epitome of Dallas-Fort Worth radio in the seventies. An obvious dig at former market giant KLIF (without ever mentioning them by name), as KVIL's fortunes waned in the 90's, it came full circle: "they can't afford to do it anymore."
. . . I see that the manufacturer of Quaaludes is not going to manufacture Quaaludes any more. That would explain the flag flying at half-mast down in the KVIL sales department. . . This 1983 composite documents the transfer of KVIL from Fairbanks to Blair Broadcasting, and features various promos. The fidelity is consistently excellent throughout. You will hear a Ron Chapman aircheck featuring Suzy Humpheries. Ken Barnett, Buddy Baron, Larry Dixon and Lynn Haley are also included.